Whether or not Harvard’s next president holds an engineering degree, SEAS and its role in Harvard’s future will constitute a central part of their tenure. This is part IV in a six-part series on Harvard's next president. Part I can be read here, part II can be read here, part III can be read here, part V can be read here, and part VI can be read here. After two decades of waiting, Harvard Engineering is ready to cross the Charles. Two Harvard presidencies have come and gone with Allston’s engineering campus perpetually on the horizon, and the announcement of University President Drew G. Faust’s impending departure guarantees that it will take at least three presidents to finish the job. “There’s no way to slow that train down. It’s barrelling ahead,” former Dean of the College and Computer Science professor Harry R. Lewis ’68 said of the move. In its pursuit of a new campus, the ramping-up of fundraising efforts, and breakneck student and faculty growth, Harvard has bet big on becoming an engineering powerhouse for the 21st century. Despite these significant investments, however, Harvard still has ground to make up. 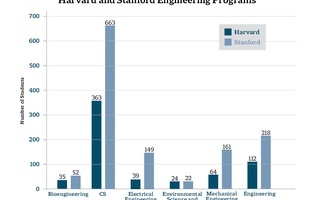 Compared to peer institutions like Stanford and neighboring MIT, Harvard’s engineering program lags behind in both size and ranking. What’s more, some professors say, Harvard’s image remains rooted in a liberal arts tradition and not associated with the applied sciences—more Shakespeare than circuitry. Whether or not Harvard’s next president holds an engineering degree, SEAS and its role in Harvard’s future will constitute a central part of their tenure. Managing the University’s fastest-growing school will be a complex endeavor, touching upon a host of hot-button issues: federal research funding, faculty “poaching” from peer institutions, historically-tense relations with Allstonians, and the puzzle of encouraging engineering’s growth without tarnishing the University’s sterling reputation in the humanities and social sciences. How Harvard’s next leader seizes what one predecessor called a “profound opportunity”—and detractors have called the “Allston Bomb”—could determine the University’s image for the 21st century. The future of SEAS and its role in shaping Harvard’s image are not lost on the presidential search committee. Even in a self-described preliminary stage, members of the Harvard Corporation have already met with Doyle multiple times to discuss his opinions on the future of the school. Precedent shows that the committee’s choice for president will play an outsized role in determining the future of engineering at Harvard. In the past twenty years, plans for SEAS’s expansion into Allston have been a primarily presidential endeavor. Two years after he assumed the Harvard presidency in 2001, Lawrence H. Summers penned an open letter outlining his plans for what he called “the Allston opportunity.” His letter would lay the groundwork for Harvard’s latest large-scale expansion and the creation of the School of Engineering and Applied Sciences. 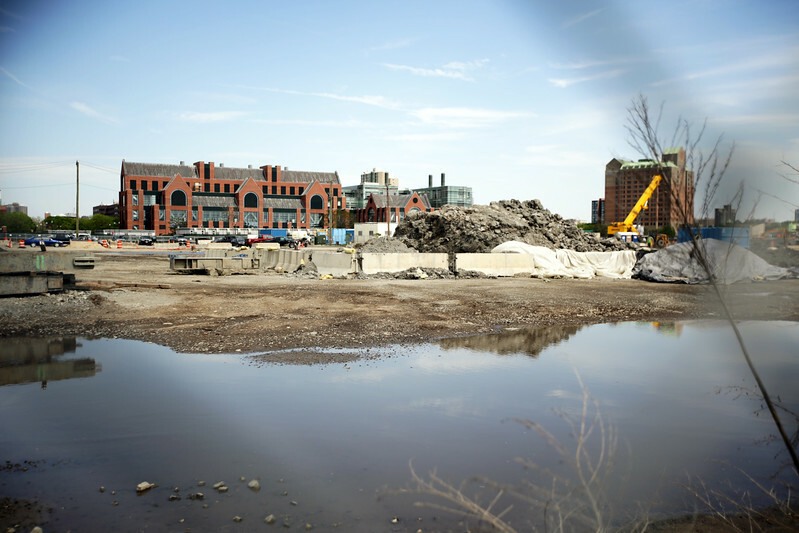 In that letter, Summers wrote that two decades of often-covert, incremental land acquisition across the Charles River presented Harvard with an unparalleled 21st century opportunity. Harvard could reengineer itself in Allston, remaining competitive in a modern educational environment. The future site of Harvard's engineering complex, under construction in May 2017. During her tenure, Faust has made engineering a priority, convincing Business School alumnus John A. Paulson to make a record-breaking $400 million gift to SEAS. And, more than a century ago, Charles W. Eliot, the University’s 21st president, toyed with the idea of absorbing MIT and moving its campus across the river—not too far from where the new engineering campus’s steel structure stands. Though the committee’s multiple meetings with Doyle indicate an interest in finding candidates who understands SEAS’s challenges, Doyle and others said an engineering background is not a prerequisite for the presidency. 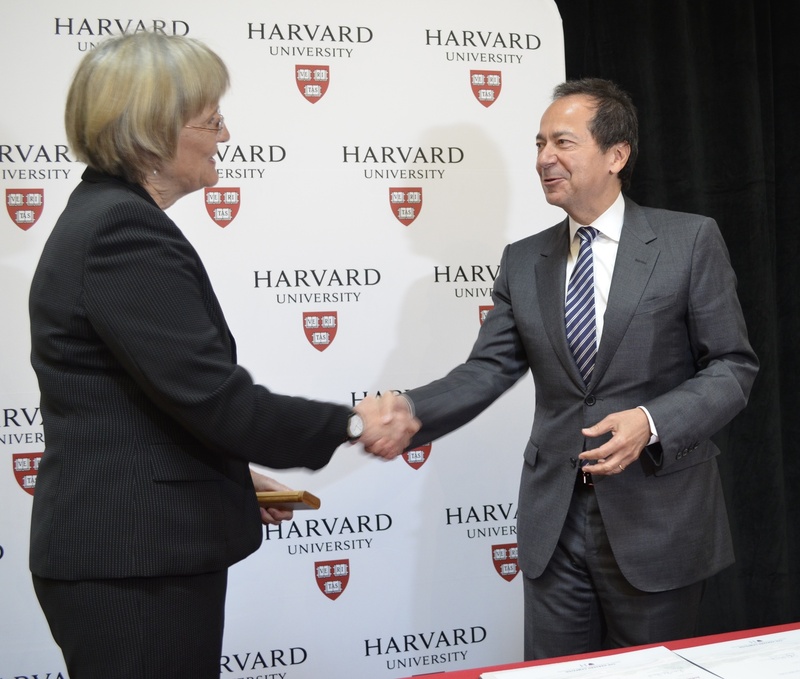 University President Drew G. Faust and hedge fund magnate John A. Paulson shake hands at an event announcing Paulson's $400 million gift to the School of Engineering and Applied Sciences. Other current and former administrators with engineering backgrounds, like FAS Dean Michael D. Smith, a Computer Science professor, and Lewis, who also served a stint as interim dean of SEAS, agree that an engineering degree is not entirely necessary. Engineer or not, the University’s next president will face challenges in executing the Allston move and fitting the University's name onto the list of top engineering programs in the nation alongside MIT, Caltech, and Stanford. In 2017’s U.S. News and World Report rankings, Harvard’s undergraduate engineering ranks 25th. Its graduate program ranks 23rd. 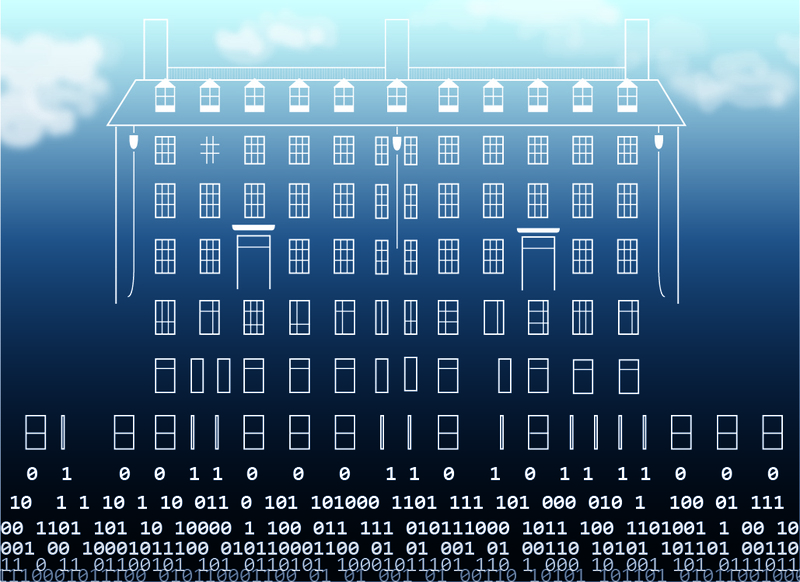 Unlike Harvard’s renowned Medical School, Business School, or Law School, Harvard’s engineering program suffers from a case of relative national anonymity. Environmental science professor Steven C. Wofsy, who has been mapping out potential bike routes from Cambridge to Allston in anticipation of the move, said SEAS is not particularly well-known. Certain Harvard affiliates have cast an anxious eye on Stanford in particular. In recent years, the Palo Alto school’s precipitous rise in national rankings and anointment as the nation’s most selective college have naturally led to comparisons to Harvard. 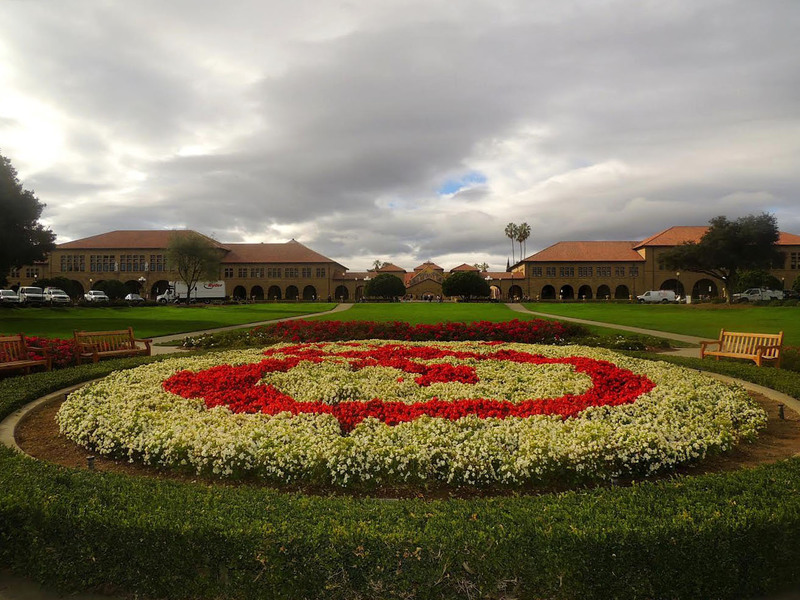 The Oval, a floral garden that features the cardinal "S" logo of Stanford University, marks the official visual entrance to the campus. While Wofsy said that comparisons of Harvard with Stanford are “pretty silly,” he acknowledged some jockeying for a university’s most prized resource: intelligent students and high-profile faculty. 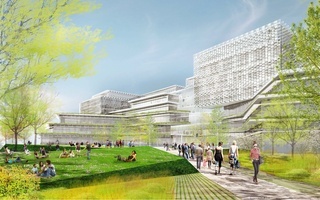 The new campus could also bolster SEAS’s faculty recruitment efforts. Both Smith and Doyle believe the new facilities in Allston will allow for a more “exciting and vibrant” community—one that could prevent faculty “poaching” from other institutions, a concern for administrators. For the past few years however, Harvard has been doing some poaching of its own. The size of Harvard’s engineering faculty rose by 30 percent in the ten years since the school’s founding, according to Doyle. For some new faculty, like Bioengineering professor Samir Mitragotri, Allston played a role in their move to Cambridge. But at a university with limited financial resources, some have wondered about the balance between Harvard’s promising future and its prestigious past in the arts, humanities, and social sciences. Just this month, SEAS reported a deficit of $9.1 million—a disproportionate amount of FAS’s total $11.7 million deficit. Doyle attributes the deficit to lingering effects of the 2008 financial crisis on the school’s endowment. Even as administrators focus on raising Harvard’s engineering profile, they are careful to pair their support for SEAS with praise for Harvard’s other academic areas. 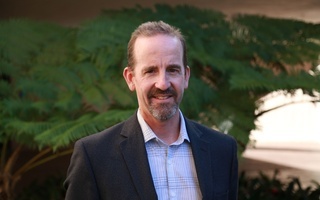 “I would hope the next president is interested in [SEAS] as an opportunity for us but also one that is to be balanced against the other strengths that we have and the importance of the humanities and the social sciences and the sciences,” Smith said. This balancing may be difficult if SEAS enrollment trends continue—the school has seen stratospheric growth in undergraduate concentrators as enrollment in the humanities and social sciences have flagged. 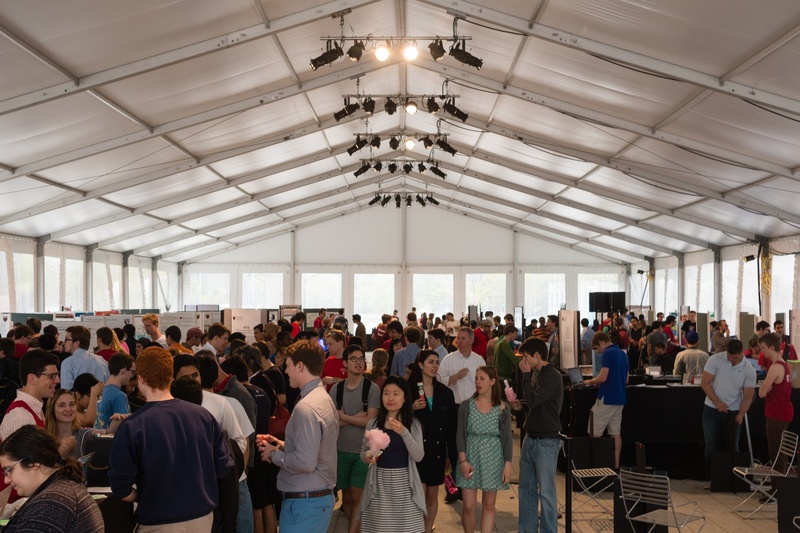 Students gather at the Science Center in 2014 to attend the SEAS fair. Still, Lewis doesn’t want SEAS to grow in a vacuum. For some humanities professors, SEAS deserves the administrative attention. “It’s the future,” he added. Doyle will assume leadership of the school on August 1 as it seeks to raise $450 million in advance of its 2019 move to a new campus in Allston.